Officials have blamed Palestinians for the overnight attack, which left a couple, two children and a baby dead in the Itamar settlement, near Nablus. Israeli PM Benjamin Netanyahu said the government would do everything possible to protect its citizens. 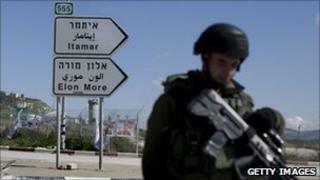 The incident comes as peace efforts between Israel and the Palestinians have ground to a halt. The family - including three children - were stabbed to death by an intruder who broke into their home, Israeli media reported. Army radio reported that two other children had been spared, while a third had discovered the killings when she arrived home. A statement on behalf of Mr Netanyahu said: "Israel will act vigorously to defend the Israeli population and to punish the murderers. "The prime minister demands that the Palestinian Authority and its head find and punish the authors of this attack." The Itamar settlement was the target of a previous attack, in 2002, in which five Israelis were killed and several injured in an attack by a Palestinian gunman. US-brokered peace talks between Israel and the Palestinians stalled last year over the issue of Israeli settlement building. Palestinians have refused all direct contact with Israel until construction is frozen. Nearly half a million Jews live in more than 100 settlements built since Israel's 1967 occupation of the West Bank and East Jerusalem. They are held to be illegal under international law, although Israel disputes this.